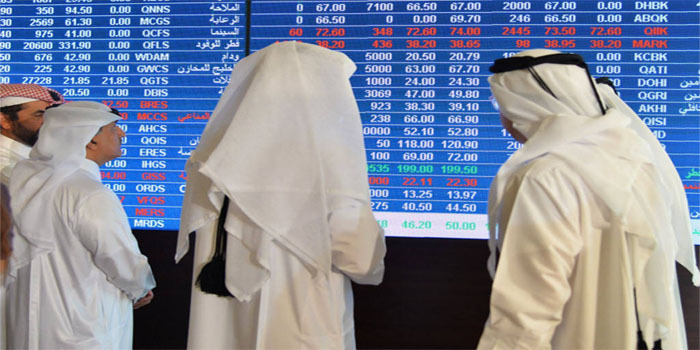 The Qatar Stock Exchange’s (QSE) general index rose 19.77 points, or 0.20%, to close at 9,976.8 points on Wednesday. The QSE’s liquidity shrank to QAR 211.9 million on Wednesday, from QAR 406.5 million in the previous session, while trading volume dropped to 8.44 million shares, against 13.55 million on Tuesday. The transportation sector led gainers and rose 1.96%, followed by the real estate and banking sectors with 1.12% and 0.93%, respectively. On the other hand, the telecommunications sector inched down 0.04%, while the goods and services sector fell 0.05%. Investment Holding Group’s stock topped risers and levelled up 3.71%, whereas Ooredoo’s stock headed fallers after sliding 3.79%. United Development’s stock, which dipped 1.31%, registered the highest trading volume with 1.4 million shares at a turnover of QAR 19.55 million, while the heavyweight Qatar National Bank’s (QNB) stock, which added 1.12%, spearheaded the QSE in terms of turnover of QAR 24.57 million after nearly 136,830 shares were exchanged.